What happens if while making a game you run out of money? Do you have a plan in place if that happens? Is there a way you can get funds while still developing? Let’s face it, if we’re in the game making business we have to think about the business part of things. Development is a giant Expense so you need Revenue to pay for it. 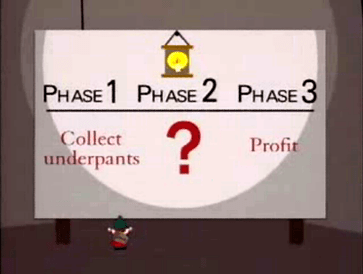 There is a business plan that you haven’t thought of yet, that will get you at least a little Revenue during each stage of the game design process. Which could make the difference between closing a game project, or continuing to develop. (I couldn’t help putting that old South Park gag in there). This suggestion is based off an older post about the 4 Stages of Game Design. Check into that if you don’t know what the four stages are yet. At GameLoop 2011 this weekend a fifth new 5 step that some dev teams are implementing was mentioned. Look for that post coming up soon. Prototype: distribute freely. That’s right, give it away. It acts as your demo. Maybe use something like paywithatweet.com to get the word out. But don’t forget to ask for donations. Gamers can be really generous when they like a game. Use these funds and the feedback to rev the game into Alpha. Alpha: charge a low amount for the alpha version of the game, promise that if people buy it now they will get all upgrades included with this price. Suggestion: 1/4 of the Full Release price. Use these funds to rev the game into Beta. Make sure people know that the price is going to go up if they wait. Beta: charge a higher amount for the beta. Suggestion: 1/2 of the Full Release price. Use these funds to rev the game into Full Release. Full release: Once the full release of the game is ready, the price should increase to the full amount. You need to set this price first, and then decide what the others will be. Tell everyone what these numbers are going to be ahead of time and stick to them. If you think this business model sounds familiar, you’re right. This is really a recap of the sales of Mojang‘s first title Minecraft. More recently QCF Design was inspired to use this model to release Desktop Dungeons. They released a freeware version of the game, then charged for Beta, more for Alpha following in Mojang’s footsetps. Notch and crew didn’t have the benefit of hindsight or success to think of this as a good publishing methodology, but I bet they had a good idea it would work. Given the right set of circumstances it could work for many independent games. A word of warning: this would not be a good strategy for developing a console game. At this stage asking console users to download many small chunks of data, getting them all vetted through the console makers, etc would be a huge hassle. For a game on Steam or self published it could do alright. Additionally restrictions in how games are published via app stores might also make this a bad business plan for an app. We’re going to cover three great business plans for apps in the future. Is this business model going to work for absolutely everyone? No. So what should come from this post? Hopefully a good conversation on your team. If you haven’t even thought about business development yet (and most beginning developers don’t), then use this as a jumping off point to explore the idea of monetization. You might not have a business guy on the team. But you still need to spend some time considering ‘business’ aspect of game design. Most game developers come from the coding or art world. Tweet this to a fellow team member and take this as an opportunity to walk for a moment in the business world. If I could ask Carl Mennah one question it would be: “What are the steps to building the infrastructure through these stages?” This is something they had to piece together themselves. Some of their trials and tribulations were rather public (IE issues with Paypal). Some decisions were private and that insight would be valuable to future attempts at making this method work. If anyone has an opinion on that, please comment. There is some great discussion about this topic over on Reddit. If you like the post, head over and give me a up vote and jump in the discussion!